When Younis Khan helped Pakistan out of a precarious situation in Pakistan's second innings of the first test against Zimbabwe, you would have known that you were in for a Younis Khan special. When it comes to test cricket, Younis Khan is arguably the best batsman Pakistan has produced. He always delivers when the team is in need, he is better than all when it comes to second innings performances, he saves tests, he wins tests, and he is a team man. Younis Khan's exploits and his relative standing compared to other batting greats of the game have been well documented on Well Pitched - here and here. Now, I attempt to figure out where he stands among Pakistani batting greats, as well as the other modern batting greats, in matches away from home and as a match winner. Everyone can score at home on pitches they are familiar with and where they have spent batting their entire life. A true test of a batsman comes when he is placed in unfamiliar conditions and tested by an unknown environment that requires him to adapt appropriately. Majority of the batsmen in this world have a better home record than an away record, but the great batsmen have as good an away record as their home record. That is what distinguishes the greats from the good. Younis Khan's century in the first test against Zimbabwe was his 22nd. He is still behind Inzamam (25), Yousuf (24), and Miandad (23), but more importantly, it was his 15th century outside of Pakistan, overtaking Inzamam Ul Haq's record of 14 centuries away from home. During his unbeaten double century against Zimbabwe, Younis Khan also became only the second Pakistani batsman to score 5,000 runs in test matches away from home. He is now only 66 runs away from Inzamam's record of 5,120 runs scored in tests played away from Pakistan. 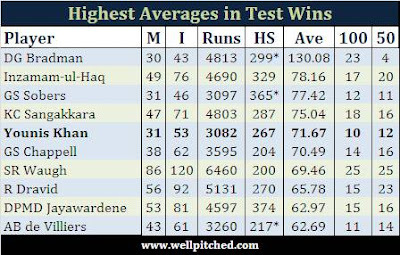 Younis Khan also has the best away average among all Pakistani batsmen who have played at least 10 innings away from Pakistan. I think this makes Younis the best batsman from Pakistan, at least when it comes to test matches in foreign conditions. Younis' stacks up well among all test batsmen also when it comes to performing away from home. His away average of 49.54 is among the top 10 averages for batsmen who have scored at least 5,000 runs in tests away from home. Another benchmark for great batsmen is how they perform in matches won by their team, or rather how many matches are won on the basis of the particular batsman's performance. Sachin Tendulkar is notorious for scoring irrelevant centuries, i.e. those that do not help India win. It is a flawed statement but perceptions are hard to change. In contrast, Inzamam Ul Haq is popularly known as the biggest match winner produced by Pakistan as majority of his test centuries have resulted in Pakistan wins. Inzamam is leaps and bounds ahead of any Pakistani batsmen when it comes to match winning performances, but Younis Khan also sits proudly at number 2 for Pakistan. Younis Khan is the second biggest match winning batsman produced by Pakistan. Younis' match winning unbeaten 200 against Zimbabwe was his 10th test century in a win, equaling Javed Miandad's 10 test centuries in wins. 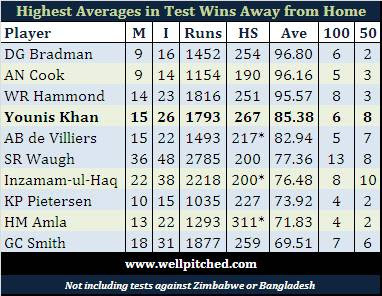 While its far behind Inzamam's 17 centuries in test wins, Younis averages in the 70s like Inzamam does. During the course of his double hundred, Younis Khan crossed 3,000 runs in test matches won by Pakistan. 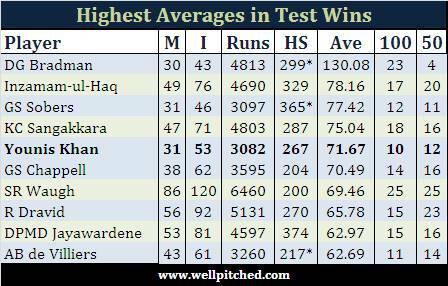 Among all batsmen who have scored at least 3,000 runs in matches won by their team, Younis has the 5th best average. Younis Khan is a true match winner! Many batsmen are often criticized for scoring easy runs on flat wickets at home or against weaker opposition. Considering this, I believe that the ultimate benchmark for a match winning batsman is the performance he has given in wins in tests played away from home against strong opposition. Taking out Zimbabwe and Bangladesh from the analysis, Younis Khan comes out to be the best performer in tests won by Pakistan away from home, with a Bradmanesque average. When compared to other batsmen around the world, Younis Khan has the 4th best average in tests wins away from home excluding matches against Zimbabwe and Bangladesh. Among contemporary batsmen, only Alastair Cook has a better average than Younis Khan. I believe that one can safely say that Younis Khan is not only one of the biggest match winners produced by Pakistan, but he is also one of the best match winning batsman in the world. Note the kind of names missing from the above list - no Sachin, no Lara, no Ponting. 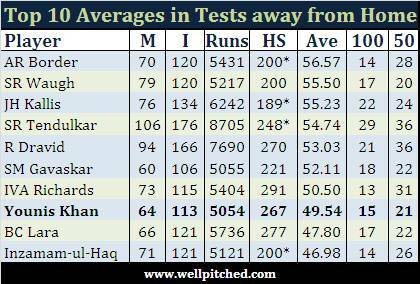 It really is a shame that Younis Khan has played only 25 test matches since the start of 2009. During the same period Alastair Cook has played 61 tests, Kevin Pietersen and Michael Clarke have played 54 each, and Sachin Tendulkar has played 42! Can you even imagine where Younis Khan would be today if Pakistan played as many tests as Australia, England, or India? He would have not only been Pakistan's leading scorer in tests, he would have been among the top 5 in the world! That's a poor generalisation. Unlike India, Pakistan do not tour the big nations all that often. If Younis hasn't scored a century in Oz, that's partly because he only played 3 matches there. Pakistan have played most of their home matches in the UAE which is easy to characterize as flat batting tracks, only they aren't. Check the scores from the Pak-Eng test series in 2012 which Pak won 3-0. Younis scored a century in the third test after both teams had made very low scores in their first innings. Scores throughout the series were low. Also, Pakistan have toured SL in the rainy season where all the pace bowlers got appreciable help from the conditions. Simply discounting all matches played in places like UAE and SL as being 'typical subcontinent conditions' is completely missing the point. Younis has 4 centuries against SA, the best bowling attack of his time. He also has a match winning 90-odd against them in SA. All these stats must be counted and generalizations should be avoided if one is to come up with a fair analysis. Matches where batsmen from both sides have struggled cannot be termed as being played on flat batting tracks.